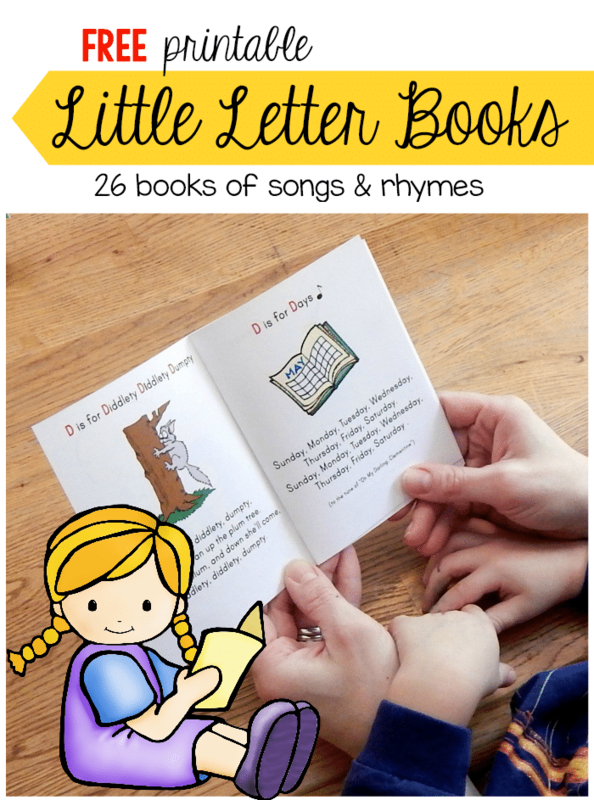 My toddler and preschooler love listening to these little letter books – each has six rhymes and/or songs for a particular letter of the alphabet. In fact, my Three can recite most of the books himself. They’re just the right size for little hands – and if they get ripped or drawn on, you can just print another! 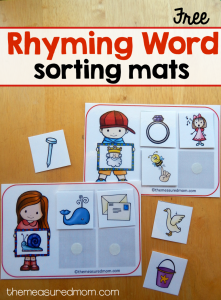 Rhymes are an important pre-reading skill (see why here). By reading and singing the books often, many children will learn the names of the letters and their sounds. Each of these links will bring you to the post sharing the letter book. Scroll down to the bottom of the post to get the book. Have you downloaded these popular freebies? These mini books are awesome. I work with children with learning disabilities. My little 6 year old is having difficulties learning his alphabet and I am really hoping these little books help him. Could you please let me know when the other letters are complete?? I’m afraid we haven’t done U yet… probably later this summer. But you can see where I collect all my letter ideas on my Pinterest boards. 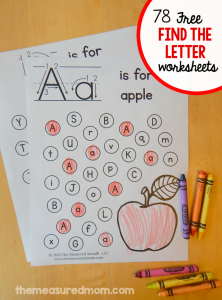 Here’s letter U: http://www.pinterest.com/themeasuredmom/letter-u/ Sorry, there’s not much there yet! Hi, I was wondering if you have the rest of the letters finished yet? Sorry to bother you with this question but I can’t find them any where on the links. Such a great resource! I can’t wait to use them with my oldest. Thank you!! i like and appreciate all your works. they are awesome. i am working with my 3 yrs old daughter on writing alphabets. she likes your little letter book very much. we are stuck on letter J can u pls tel me wen it will be out. Hello, Naina! I apologize if I never got back to you. I am going through my comments and see your question about my letter books. If I never wrote you back about these, please send me an email at themeasuredmom@gmail.com and we can work something out. Thanks! These mini books are super interesting. I work with my 2 years old grandson . My little 2 years old is having difficulties learning his alphabet and I am really hoping these little books help him. Could you please let me know when the other letters are complete? Can you please email me once it’s completed. thanks . Hello! 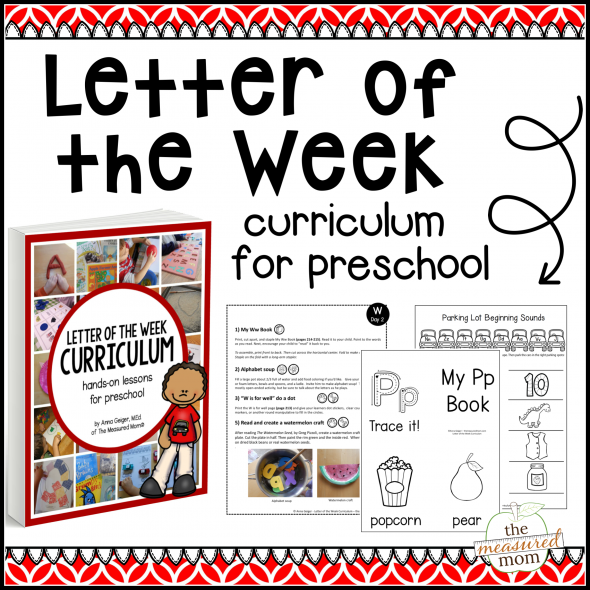 If you send me an email I can give you more information about the letter books — themeasuredmom@gmail.com. Thank you for the well wishes on our baby… she is 6 weeks old now and doing great! I absolutely love these little books! Thank you so much for all of your hard work in putting them together for the rest of the world to use! You’re very welcome, Toni, and I love to hear that people enjoy these! These were actually some of the first printables on my site. Can’t wait until we’re done with the alphabet and they’re all here!! Thank you so much for these lovely books. My 2 years old enjoy them very much. Hi, I wanted to say that these letter books are wonderful. My youngest loves them. I was also wondering if you have an indication of when the other letters may be available as I would love to keep using these for the rest of the alphabet. Hi Anna. Thanks so much for sharing these mini alphabet books! I love them and can’t wait to use them in my classroom. Just wondering, when you are done with letters d, j, p, r, s, and u, will you post them here? Or will I find them on another page? Just let me know when you can. I love your little letter books. I work in a Mother’s Day Out program with Pre K kiddos and they love them. At the first of the week I get asked if I have a new book for them. Can’t wait to see the last couple of letters but we won’t be getting to them until after Christmas anyway. Thanks for sharing! So glad you’re enjoying them, Melissa! They should all be up before Christmas. 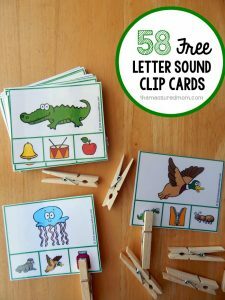 Hi,These ideas and printable are awesome.I’ll definitely use them with my pupils.Thanks. hi do you have the little letter D book yet? I love your little books. It’s a great reminder for me of all the great little songs and fingerplays that I used years ago (almost 30) when I started teaching kindergarten. I appreciate these! I am looking forward to the posting of D this week! Has J been posted? Thanks so much for sharing your learning resources. We are avid users of you letter book list and alphabet books. My daughter loves the books. I was wondering if you have letter R ready yet in the the alphabet books? Hi Gina! I’m so glad you enjoy our book lists and letter books. They’re almost all done – finally! Check back on the blog tomorrow (Sunday). I’m planning to have the letter R book up then. Is there anyway to download all letters at the same time? Just trying to save a little time to do it all at once. Hello, Dawn! I’m so glad you found my site. 🙂 I look forward to packaging these into a couple of downloads when all the holiday and new year craziness dies down. 🙂 Our baby girl actually just turned 10 months… time flies! Thank you so much for your comment, Claudia – that is wonderful to hear! Love your site and these books. On face book I saw a craft you made with rhyming words and a clip. I want to make but can’t find in anymore. Can you send me a link? I just went to print this out, and it is not working. all of the text is just Xs. I don’t know if it is because of my computer or if there is something wrong with the file, but I thought I might as well let you know. These are great BTW! I love them! These little books are my favorite. Thank you for all your hard work and amazing resources. I’m so glad I found your website! My kids have benefited greatly. Thank you very much for being generous in sharing your freebies. The knowledge and experiences you have been posting in this website support my teaching as a Preschool Teacher. More power to you and your family. You’re very welcome! I’m so glad my website helps you in your teaching. I hope you keep finding more things you can use! Ms. Anna you are awesome, diligent and very creative in making those little alphabet books. I will definitely use them in my class everyday from now on. Thanks a ton for sharing this to us. Thank you so much for these adorable little letter books and all the other goodies you share. Everything is used and loved in my KG class over and over again. Thank you so much for all of your beautiful printables. If I miss a week of sending home a letter book with my kindergarten students I sure hear about it (from parents and kids!). 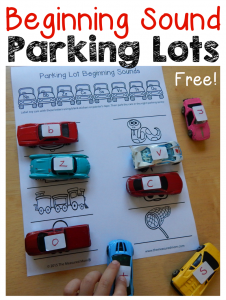 The fine motor activities are also a great addition to reinforcing the letter sounds. I’m so happy to hear that Stephanie! These were some of my very first printables, and I just love to hear that other children are enjoying them. Thank you for taking the time to comment! ohhhhhhh! superb rhymes. I can sit before your website and i could gather many things for my school children. really awesome.. It saves my time also i become lazy since i could not work myself. your website gives me almost everything what my children need. Please do continue. Amei !! Que atividades enriquecedoras!! Hello Anna, I work in a special needs class and am looking for some new resources to use with the kids. I have found several here on your website and am looking forward to trying them all out. I will have to let you know how things go once I bring them in and start working with them. Thank you for the opportunity to use the resources you have here. You’re very welcome, Theresa! I hope you find many helpful resources on my site. Thank-You for all the free information & printables. I love looking through your site & finding so many great ways to teach my children. Above it says 26 free alphabet books rhymes & songs, I’ve tried to get it to open to the link for the free books but no luck. Can you email the link to me please? Awesome! Thank you for free printables. Saved my time. God bless you! Thank you so much for your freebies. I would love to use them in my class. It is exactly what I was looking for my students. This is Kate, Anna’s assistant. Please click on one of the links above, such as “Letter A.” In the new post that opens, you’ll look for a green box that says, “CLICK HERE.” The file should open right up for you. Some of the files on Anna’s website open directly, and some are sent to your inbox. Either way, the files are free. Just follow the prompts to get your free files. Enjoy!